In the Know: What's in Store for ETFs in the Fourth Quarter of 2018? You are at:Home»Equity ETFs»In the Know: What’s in Store for ETFs in Q4 2018? As third quarter earnings results continue to reveal themselves, the capital markets are already in the thick of a volatile fourth quarter start with the Dow Jones Industrial Average giving investors the roller coaster ride they’re not accustomed to after the unflinching bull market run for most of 2018. However, as the markets change, investors need to adapt, particularly with respect to their exchanged-traded fund (ETF) investments. 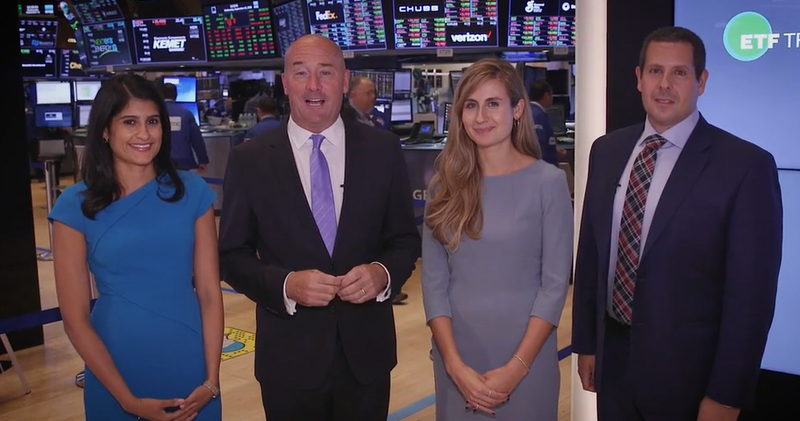 In the latest “In The Know” update, J.P. Morgan Asset Management highlighted a bevy of trends in the current ETF landscape, such as the flow of capital, as well as opportunities abound in U.S. equities, international equities and fixed income. With the S&P 500 recording the longest ever bull market and the Nasdaq Composite breaking past the 8,000-point level, the waning effects of a late market cycle may be underway with more corrections. Either way, it’s important for investors to stay ahead of new trends in the broad market and ETFs by staying In The Know that was filmed at the New York Stock Exchange and features market experts–Yasmin Dahya, Head of Americas Beta Specialists at JP Morgan Asset Management; Samantha Azzarello, Global Market Strategist at JP Morgan ETFs; and Douglas Yones, Head of Exchange Traded Products at NYSE. ETFs have carved out their own niche in the financial sector, but with their exponential growth following the financial crisis 10 years ago, the industry has undergone a maturation process and changes are still abound. At the New York Stock Exchange, Yones witnesses this firsthand and one area where he sees changes forthcoming is in actively-managed funds. “A lot of people forget that we have actively-managed ETFs today,” said Yones. “All ETFs track an index–we just tend not to think about them because they’re growing from a smaller base, but they’re growing quite quickly. What’s neat is what’s happening now in the regulatory environment. “We’re hopeful that we’ll get a product structure approved later this year or early next year where a traditional active manager–someone who doesn’t want to show what they’re buying and selling each day–can wrap that strategy in an ETF and give it to investors everywhere,” Yones added. In the third quarter, the Federal Reserve increased the federal funds rate by 25 basis for the third time this year as expected. The latest sell-offs in the market have been blamed by rising interest rates, but Azzarello reminds investors to stay resilient and that rising rates could be a blessing in disguise.